Designed to fit seamlessly into a high-resolution production workflow, the GVS9000 4XU DDR offers a Virtual Tape capability that allows users to incrementally move to a digital disk based workflow. With this digital disk based technology, the GVS9000 4XU LIVE CAPTURE provides a single flexible platform for all your content production from live and post production applications. Offering a huge choice of QuickTime and DPX Video hardware and industry standard compatibility with leading video editing software, GVS9000 4XU VTR is a professional, non-linear CAPTURE with uncompressed DVCPRO HD, SD, HD 720P, 1080i/p up to 60p dual-link 4:4:4 and 2K support and provides transparent storage and sharing over quad 4 Gb/s fibre and dual gigabit network for edit and playback uncompressed for best possible quality, providing simple uncompressed film and broadcast production at a fraction of a cost of traditional film base production. The GVS9000 4XU DDR allows up to 16 concurrent HD users to share content at the same time. No other storage technology provides the media to seamlessly capture 16xHD content at the same time. This technology introduces a remarkable production ability to capture live event and edit, and view all convert movies, remove scratches, or edit content in a complete uncompressed shared environment with heights possible quality from camera to disk offering dynamic range of 13 stops that offered by traditional film. Live Capture! Is the latest revolution from GVS, offering the ability to record picture into a QuickTime movie, but with that Movie available immediately for editorial as soon as recording BEGINS. Additional picture becomes available to editors in the background automatically as the recording progresses. Applications include Sports/OB recording, News, Telecine, AudioPost and much more. Live Capture! Offers options including Audio LTC capture, 9-pin deck control. It also includes GVS's Unique ActionHilite XML Clip capability allowing operators to mark subclips on the fly for instant import to Final Cut Pro as short subclips of the recording. Combined Nomadic4U storage with GVS9000 4XU DDR offers excellent performance, superb integration with a variety of recorder, and enables cost effective electronic transfer of high-resolution masters. 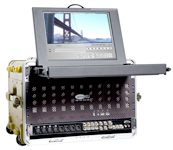 Beginning with capture – via telecine, direct from digital camera, tape or direct to disk animation – GVS9000 4XU DDR technology records an exact copy of the original content. Throughout the post process, from color correction to DSR, editing, effects, audio processing finishing and optional down conversion for distribution, 4XU DDR can integrate with or replace portions of existing recorder. • Capture live event with audio LTC time code stamped in native DPX or QuickTime with following codecs. • Movies are available for instant playback uncompressed quality 3.0Gbit/sec as opposed to traditional tape base 400 or 800Mbit/sec, compressed MPEG2 tape recorders. • ActionHiliter™ XML technology, allows instant marking of ‘action’ events, as they happen, interactively feeding Final Cut Pro Editorial in real time. • Modular architecture supports multiple records, Playback and Final Cut Pro editorial channels. • Audio Post recording time stamped QuickTime movies, with instant availability of picture to networked clients. • 9-pin machine control for programmed ingest from videotape, or from real-time output of picture editorial system. • Movies are available for immediate playback whilst still being recorded, feeding GVS’s BASS, Digidesign Pro Tools and other QuickTime or DPX compatible recorder. • Central capture can feed multiple edit via fiber or gigabit network for editor. • Longform production saves hours of transfer time between Picture Editorial and Audio Post. • Eliminates tape transfers using real-time technology without rendering video effects to disk with highest quality. • Saves HOURS of transfer time per hour of material, allowing video/audio post to immediately start working against new cut, whilst it is printed from picture editorial system. Start editing in Final Cut whilst the same material loads in from tape. Whatever your requirements, GVS9000 4XU DDR offers flexibility, speed, and the highest possible image quality. Using visually lossless, highly efficient Quality Encoding fiber base shared image storage the 4XU DDR provides the most accurate digital replica of your projects available today. Support for 23.98, 24, 25, 29.97, 30, 48, 50, 59.94, and 60 frame images, progressive, interlaced and segmented frames, drop and non-drop, allows you to work with images at their native resolution and frame rate. With this introduction, 4XU DDR provides the best platform for cost effective video production and post as well as 4K digital intermediate to come.